Washington, D.C. (May 27, 2004) - The U.S. Navy announced today that Lockheed Martin Corporation Ð Maritime Systems & Sensors, Moorestown, N.J., will be one of two defense contracting teams awarded contract options for final system design with options for detail design and construction of up to two Flight 0 Littoral Combat Ships (LCS). The LCS is an entirely new breed of U.S. Navy warship. A fast, agile, and networked surface combatant, LCS's modular, focused-mission design will provide Combatant Commanders the required warfighting capabilities and operational flexibility to ensure maritime dominance and access for the joint force. LCS will operate with focused-mission packages that deploy manned and unmanned vehicles to execute missions including, Special Operations Forces (SOF) support, high-speed transit, Maritime Interdiction Operations (MIO), Intelligence, Surveillance and Reconnaissance (ISR), and Anti-Terrorism/Force Protection (AT/FP). Marinette, Wis. (Aug. 16, 2006) - The first Littoral Combat Ship, Freedom (LCS 1) is shown under construction in Marinette, Wis. LCS is a new class of ship designed to be a fast, agile and networked warship able to execute focused missions to defeat shallow water threats such as mines, diesel-electric submarines and fast surface crafts. Freedom is scheduled to be christened on Sept. 23, 2006. Marinette, Wis. (Sept. 8, 2006) - The first Littoral Combat Ship, Freedom (LCS 1) is shown under construction in Marinette, Wis. LCS is a new class of ship designed to be a fast, agile and networked warship able to execute focused missions to defeat shallow water threats such as mines, diesel-electric submarines and fast surface crafts. Freedom is scheduled to be christened on Sept. 23, 2006. 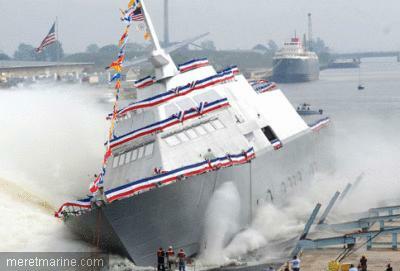 Marinette, Wis. (Sept. 23, 2006) – The nation’s first Littoral Combat Ship, Freedom (LCS 1) – the inaugural ship in an entirely new class of U.S. Navy surface warships – prepares to make a side launch during her christening at the Marinette Marine shipyard. The agile 377-foot Freedom -- designed and built by a team led by Lockheed Martin -- will help the U.S. Navy defeat growing littoral, or close-to-shore, threats and provide access and dominance in coastal water battle-space. Displacing 3,000 metric tons and with a capability of reaching speeds well over 40 knots, Freedom will be a fast, maneuverable and networked surface combatant with operational flexibility to execute focused missions, such as mine warfare, anti-submarine warfare, surface warfare and humanitarian relief. Tu as raison Michel, mais bon attendons de voir les équipements et l'armement ! En tout cas, sur la 2éme photo (hors de l'eau) on s' aperçoit que le bâtiment n'est pas équipé d'un sonar de coque ! Donc pas de fonction asm pour les LCS ???? La marine américaine a ordonné à Lockheed Martin, le 12 janvier, de stopper la construction du second prototype réalisé dans le cadre du programme Littoral Combat Ship (LCS). Cette interruption, d'une durée de 90 jours, doit permettre de mener une enquête sur l'explosion du budget alloué au navire. « Nous espérons que l'accroissement des coûts est dû à une sous-estimation des heures de travail », a expliqué un porte-parole de l'US Navy. Selon la lettre d'information stratégique TTU, l'USS Freedom (LCS 1), tête de série, a dépassé de 27% le budget initial. Le navire, lancé l'an passé aux chantiers Marinette Marine de Manitowoc, doit réaliser ses essais mer cette année. Son sistership est, quant à lui, construit par Bollinger à Lockport. Toujours selon TTU, un rapport publié en décembre par le Congressional Research Service (CRS) évalue les 56 frégates du programme LCS à 26 milliards de dollars, contre 17.6 milliards initialement prévus. Cela porterait le coût unitaire de ces petits bâtiments de 115 mètres et 2800 tonnes à 460 millions de dollars. Si ce prix se confirmait, les LCS seraient très difficilement vendables à l'export, alors que Lockheed souhaite décrocher des contrats à l'étranger, notamment en Arabie Saoudite. A titre de comparaison, une frégate multi-missions (137 mètres, 5500 tonnes), nettement plus armée, est estimée à environ 500 millions de dollars. Outre le team mené par Lockheed Martin, General Dynamics et Austal réalisent également deux prototypes (LCS 2 et LCS 4), en vue de décrocher le marché américain. Les quatre bâtiments doivent se mesurer à la mer avant que l'US Navy ne fasse son choix. La marine américaine a finalement décidé d'annuler la commande de la troisième frégate du type Littoral Combat Ship. Le bâtiment, Conçu par Lockheed Martin en coopération avec Gibbs & Cox, Marinette Marine et Bollinger, avait été mis sur cale aux chantiers Bollinger, de Lockport, en 2006. Suite à un dépassement de coût de 50%, l'US Navy avait fait interrompre la construction entre le 12 janvier et le 15 mars 2007. Aucune solution n'ayant été trouvée avec le maître d'oeuvre, la décision a finalement été prise en avril d'annuler le contrat. La commande de deux LCS prévue au budget 2007 a été reportée et les lignes de crédits affectées au surcoût rencontré. Le team de Lockheed Martin de dispose donc plus que du Freedom, la tête de série, pour tenter de remporter le marché du programme LCS. Un autre groupe, composé de General Dynamics, BIW et Austal est en compétition. Ce team présente l'Independence, doté d'une coque trimaran en aluminium. Son lancement aux chantiers Austal, de Mobile, est prévu en décembre prochain pour une mise en service à l'été 2008. La marine américaine fera alors son choix entre les deux modèles. Compte tenu des dépassements de coûts déjà enregistrés, la série ne pourrait toutefois comprendre que 20 à 30 unités, contre 58 à 82 initialement prévues. MARINETTE, WI, October 11, 2007 – The Lockheed Martin [NYSE: LMT] Littoral Combat Ship (LCS) team recently demonstrated the successful operation of Freedom (LCS 1)’s automated stern doors, articulating stern ramp and the side launch doors, key elements of the unique launch and recovery system of the nation’s first LCS. To assist the U.S. Navy in future littoral – or close-to-shore – operations, the agile 377-foot Freedom’s design was optimized for the launch and recovery for an array of manned and unmanned watercraft that can undertake several missions including anti-submarine warfare, minehunting, surface warfare and special operations, as well as humanitarian aid. To aid mission success, the ship provides multiple launch and recovery points, providing unprecedented waterline access with both a stern ramp and a side door. Freedom’s innovative stern ramp offers the capability of launching and recovering large hard-bottomed vehicles such as 11 meter rigid hull inflatable boats (RHIBs) or the special operations forces high speed boat, while the ship is underway. 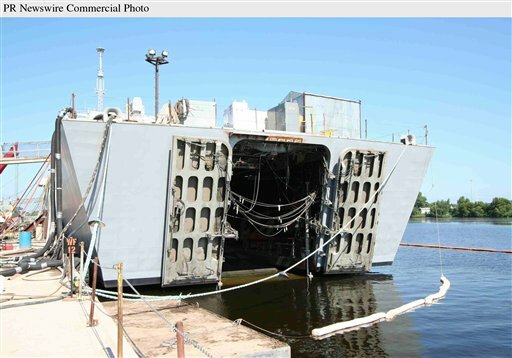 The unique side door in the LCS’s design provides a second launch and recovery point for smaller vehicles and can also be used for replenishment and refueling of at-sea mission packages. Both access points are serviced by an overhead crane system that extends overboard and is capable of lifting any vehicle designed to be carried by the LCS. This truly innovative system services two mission bays for safe and efficient handling and storage of watercraft in support of reduced crew manning. Freedom is currently under construction at Marinette Marine in Marinette, WI, where continuing outfitting and testing are being completed for delivery in 2008. Freedom will be home ported in San Diego, CA. The Lockheed Martin team design for LCS is a survivable, semi-planing steel monohull that provides outstanding maneuverability with proven sea-keeping characteristics to support launch and recovery operations, mission execution and optimum crew comfort. Team members also includes naval architect Gibbs & Cox, ship builders Marinette Marine, a subsidiary of The Manitowoc Company, Inc. [NYSE: MTW], and Bollinger Shipyards, as well as best-of-industry domestic and international teammates to provide a flexible, low-risk war fighting solution. Headquartered in Bethesda, MD, Lockheed Martin employs about 140,000 people worldwide and is principally engaged in the research, design, development, manufacture, integration and sustainment of advanced technology systems, products and services. WASHINGTON (NNS) -- Secretary of the Navy Donald C. Winter and Chief of Naval Operations Adm. Gary Roughead announced Nov. 1 that the Department of the Navy is terminating construction of the fourth littoral combat ship (LCS 4) for convenience under the termination clause of the contract because the Navy and General Dynamics could not reach agreement on the terms of a modified contract. The Navy had not yet authorized construction on LCS 4, following a series of cost overruns on LCS 2. 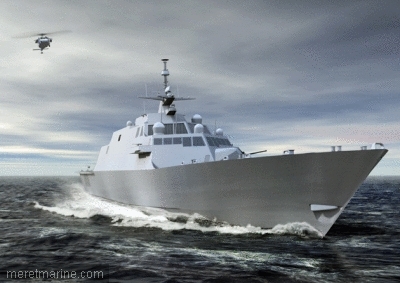 The Navy intended to begin construction of LCS 4 if the Navy and General Dynamics could agree on the terms for a fixed-price incentive agreement. The Navy worked closely with General Dynamics to try to restructure the agreement for LCS 4 to more equitably balance cost and risk, but could not come to terms and conditions that were acceptable to both parties. The Navy remains committed to the LCS program. "LCS continues to be a critical warfighting requirement for our Navy to maintain dominance in the littorals and strategic choke points around the world," said Winter. "While this is a difficult decision, we recognize that active oversight and strict cost controls in the early years are necessary to ensuring we can deliver these ships to the fleet over the long term." "I am absolutely committed to the Littoral Combat Ship," said Roughead. "We need this ship. It is very important that our acquisition efforts produce the right littoral combat ship capability to the fleet at the right cost." MARINETTE, WI, July 28, 2008 – History was made today when the nation’s first Littoral Combat Ship, Freedom (LCS 1), put to sea for the first time, marking the beginning of Builder’s Sea Trials for the first-in-class coastal surface combatant. The agile 378-foot Freedom, designed and built by a Lockheed Martin [NYSE: LMT]-led industry team, is conducting Builder’s Sea Trials in Lake Michigan. The trials – which are a coordinated effort between the U.S. Navy and the Lockheed Martin team – will include operational testing of the vessel’s propulsion, communications, navigation and mission systems, as well as all related support systems. Following the completion of Builder’s Sea Trials, Freedom will return to Marinette Marine to prepare for Acceptance Trials that will be conducted by the U.S. Navy’s Board of Inspection and Survey. LCS 1 will be delivered to the Navy later this year and home ported in San Diego, CA. The Lockheed Martin team’s design for LCS is a survivable, semi-planing steel monohull that provides outstanding maneuverability with proven sea-keeping characteristics to support launch and recovery operations, mission execution and optimum crew comfort. Team members also include naval architect Gibbs & Cox, ship builders Marinette Marine, a subsidiary of The Manitowoc Company, Inc. [NYSE: MTW], and Bollinger Shipyards, as well as best-of-industry domestic and international teammates to provide a flexible, low-risk war fighting solution. Headquartered in Bethesda, MD, Lockheed Martin employs about 140,000 people worldwide and is principally engaged in the research, design, development, manufacture, integration and sustainment of advanced technology systems, products and services. The Corporation reported 2007 sales of $41.9 billion. Superbe unité, avec un bien beau comportement sur mer calme . Mais, en cas de poste d'ancrage, comment on fait car je n'ai pas vu les ancres?